This new overnight skin saviour is nature’s antidote to festive frolicking and overindulgence; just one application is all it takes to reveal softer, smoother, and younger looking skin. Innovative, naturally derived AHAs and BHAs from Australian lime pearl extract, fruit acid complexes and willow bark extract deeply exfoliate the skin, whilst stimulating collagen production for a healthy, youthful glow. Parched skin is also quenched thanks to tropical coconut water and hyaluronic acid, meaning no uncomfortable aftermath as is common with most harsh acid peels, just beautifully plump, bright, and smooth skin. We have all your new year beauty resolutions covered in just one bottle! Don’t worry if you have sensitive skin, Good Skin Day can be used on all skin types, but a patch test on particularly sensitive skin is recommended. 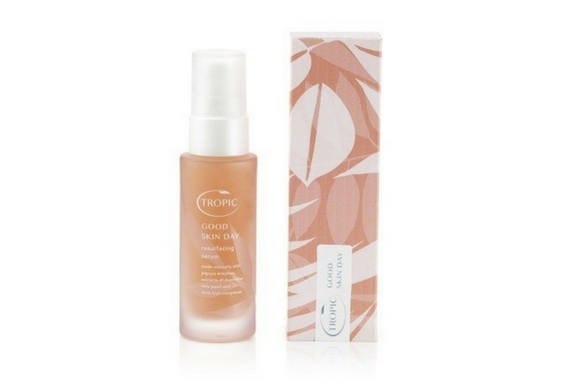 Good Skin Day serum can be purchased from Tropic.